Here we go – time to hang the lights on the house. As Clark Griswold made famous in “Christmas Vacation”, the goal is to put up more lights than anyone else. Get your staple gun out, go to Home Depot and buy all the lights you can. Climb on the roof and start nailing! We don’t recommend this actually. As Clark learned, falling off a roof isn’t that hard to do. We climb up on roofs every day. But we’re trained professionals. It’s still dangerous. Especially if there is any snow or ice. 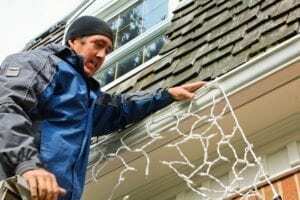 Even hanging lights on the gutters like this guy is doing is actually quite dangerous. See how he is leaning out to place just another small section of lights… We’ve all done it but it’s not wise. Stay centered on your ladder. Take a few more minutes and move the ladder more often to keep your weight centered. And always have a spotter holding the ladder in place. Enjoy your Holidays and be safe. Call us with any roofing concerns you might have.